In many ways the Punic Wars resembled the Peloponnesian War. Both conflicts featured a land based military power (Rome in the Punic Wars and Sparta in the Peloponnesian War) defeating a wealthy trade based Thalassocracy (Carthage in the Punic Wars and Athens in the Peloponnesian War). By 275 BC, Rome had defeated the Greeks in mainland Italy and now controlled the entire Southern portion of the Italian peninsula. Rome was now a major power in the Mediterranean and wasted no time in planning their next military conquest, they turned their eyes to the Island of Sicily. 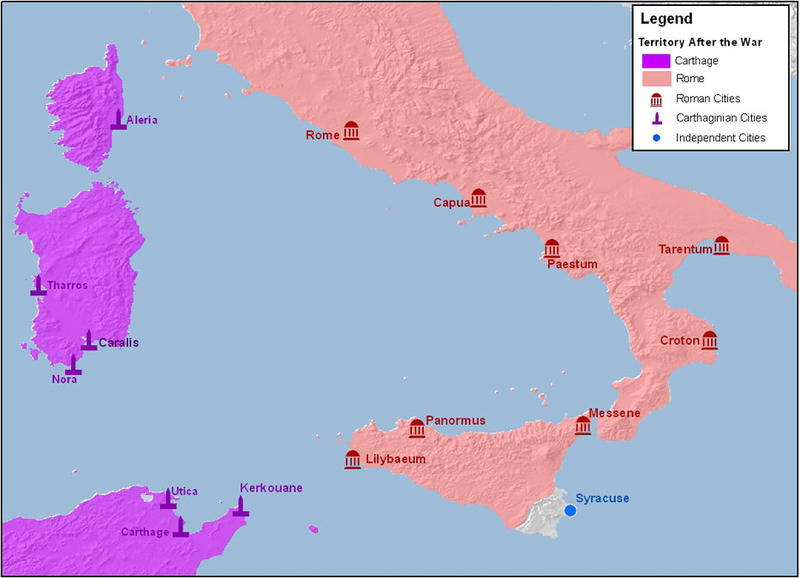 At the time Sicily was an island rich in resources that was controlled by Carthage in the west, and the Greek city-states in the east, the largest being the city of Syracuse (See map 1). In 264 BC, Rome invaded the island of Sicily at the behest of the Mamertines, a group of marauding ex-mercenaries whose pillaging exploits had recently been put to an end by Carthage’s growing control of the island. Syracuse was traditionally an enemy of Carthage, but could not tolerate continued unruly forays from the Mamertines into their territory, or the possibility of Rome taking over the island, so they allied with Carthage. To protect their supply lines to the island, Rome was forced to embark on an ambitious ship building project. Rome had hitherto been a land based military power and could not match the naval superiority of Carthage, they lost a number of naval engagements against Carthage at the beginning of the war. However Rome eventually managed to capture a Carthaginian Quinquereme and copy the design. Once Roman naval technology matched that of Carthage the tables turned, as Carthage could not match production levels of Rome (See map 2). The First Punic War ended with Rome as the victor and new master of the island of Sicily (See map 3). Immediately following the war, Carthage's mercenaries revolted over a pay dispute and occupied a number of important Punic cities in North Africa and Sardinia, beginning the Mercenary War. Miraculously, Carthage was able to defeat the mercenaries in North Africa, meanwhile Rome used the Mercenary revolt as an excuse to invade and conquer the islands of Sardinia and Corsica (See map 4). Thus by 238 BC, Carthage had lost all of her islands in the Central Mediterranean, but perhaps the biggest lose of all was the Mediterranean Sea itself, Carthage no longer controlled the seas, which would force them in the Second Punic War to invade Italy not by sea but by land, over the Alps.